The South Western Sydney Clinical School manages the day-to-day operations of the Ingham Institute Clinical Skills and Simulation Centre. 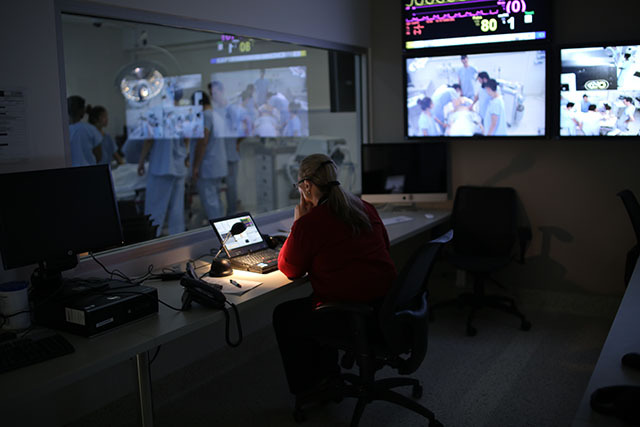 This Centre provides a unique opportunity for the School to support research into the effectiveness of simulation as a learning methodology or in the translation of research findings into clinical practice in a simulated environment. To seed research in this area the School is pleased to announce that we will support a PhD scholarship for full-time study in either of these areas. More information on the Centre is available from the dedicated SWS Clinical Skills and Simulation site. The Ingham Institute Clinical Skills and Simulation Centre is pleased to announce the availability of a postgraduate research scholarship ($30,000 per year for full-time enrolment) to support a student enrolled at UNSW to undertake a project in south western Sydney commencing in 2016. The scholarship is part of the broader aims of the School to continue to promote research activity in the south west and to seed research in the area of simulation. The SWSCS Simulation Scholarship will focus on the use of simulation as a teaching methodology or in the translation of research into clinical practice. Expressions of interest are invited for PhD or Masters projects focusing on either of these areas. Prospective applicants should download the application forms (below) and obtain two (2) confidential referee's reports to meet the application deadline of 1st February 2016. This is a scholarship funded by the South Western Sydney Clinical School and will be governed by the conditions set for an Australian Postgraduate Award. Students must be enrolled at the South Western Sydney Clinical School in order to be allocated the scholarship. Enrolment can occur after a decision has been made on the preferred candidate for the scholarship. Proposed primary supervisors can be sought from outside UNSW; however, they will be required to take out a visiting or conjoint appointment at UNSW for the period of the supervision and acknowledge this affiliation in any publications arising from the supervision. The research must occur in south western Sydney utilising the facilities of the Ingham Institute Clinical Skills and Simulation Centre. The award is for two years full-time equivalent (for a Masters by Research) or three years full-time equivalent (for a PhD) with a possible six month extension, subject to submission of an annual report and granting of satisfactory progress by the student’s supervisor. No late applicants will be accepted. No concurrent funding for the position will be available, however, individual salary boosts (top-ups organised by supervisor) may be allowed with other sources of funds. The holder of the scholarship shall not hold another scholarship with a value or more than 75% of the APA stipend rate. Transfer to another project will result in cessation of scholarship and the need to re-apply if continued funding is desired. Awardees are to attend the School’s annual postgraduate reviews and to complete annual progress reports. Failure to provide an annual report or to attend a postgraduate review may result in termination of the scholarship. Applications will be assessed by a Scientific Committee and the School reserves the right not to award scholarships as a result of feedback from the Scientific Committee.